Can Acrylic Photo Prints Enhance Photos? Quite frankly, the majority of people are actually not that familiar with the qualities that acrylic glass is able to offer. Instead, whenever there occurs a necessity for displaying a personal photo, these people go either for a mat paper or, in the worst case scenario, a plain cardboard backing with a rather regular-looking wooden frame stacked around it. All the while, there’s a genuinely sophisticated and quality-boosting alternative available just a one click away. This alternative is, of course, photo acrylic print. Acrylic glass (also known as Acrylite, Lucite, Plexiglas, etc. depending on the shop you’re visiting) is a widely used transparent thermoplastic which usually serves as an alternative to regular glass. Although technically classified as a type of glass, acrylic actually isn’t a silica-based glass (as regular glass and all of its subtypes are), being a synthetic polymer instead. Developed in the late 1920’s, the material was introduced to a wider market in 1933 under the trademark of Plexiglas. As of 2018, it is one of the most popular formats for customizable wall decor items in the world. The following vividly illustrates what exactly makes it the crowd’s favorite. There are plenty of reasons why acrylic glass is the most popular substitute for regular glass. With an excellent tensile and flexural strength, complete transparency, polishability, and its capacity to prevent any UV-induced damage, acrylic glass is pretty much the ultimate coating for your favourite photo. A more cost-effective alternative to polycarbonate, acrylic also does not contain bisphenol-A, a potentially harmful compound found in its chemical sibling polycarbonate. With the above-stated properties, low production cost, and generally ergonomic nature, acrylic glass has consequently become one of the most popular commercially available glass substitutes on the market. And, more so than with any other decorative product, this makes all of us benefactors. Now, after a little historical insight, we can finally return to the main topic. If there’s any potential flaw one must consider before printing his/her beloved photo on canvas, then it’s definitely the possibility of slightly diminished contrasts and accents. If your chosen photo is not particularly sharp and does not boast a vivid palette by default (which is often an intentional move to acquire a certain aesthetic), you might end up with an unexpectedly bland image. Acrylic glass, on the other hand, will only enhance the strong hues and save originally dim ones from disappearing completely. To begin with, the crystal clear matter of acrylic significantly boosts the sharpness of your photo while also increasing the dynamic range of the image. In practice, this means beautiful velvety dark areas pleasantly contrasting with vibrant colored ones. Your photo will simply become richer and more expressive. The format works particularly well with photos that have predominant areas of negative space, making it especially suitable for monochromatic fine art photography. The acrylic photo prints are also renowned for their borderline spatial quality provided by the thickness of the glass. With light reflecting, ricocheting, and playing on the surface of your photo print, the image will seem to have acquired a new life! Although incomparable with canvas prints in most respects, as each has their own share of pros and cons, there are certain differences between the two formats that are worth a mention. Now, the single biggest difference between canvas and acrylic photo print is the matter on which the actual image is printed on, and the way it’s carried out. While in the case of the former it’s a high-quality textile with direct printing, the latter sees your image printed on a genuine, lab-quality photo paper. The image is then mounted onto a precisely cut sheet of acrylic glass and squeezed between the sheet and a hard-plastic backing. It’s a complex procedure to carry out, but the results are totally worth it. 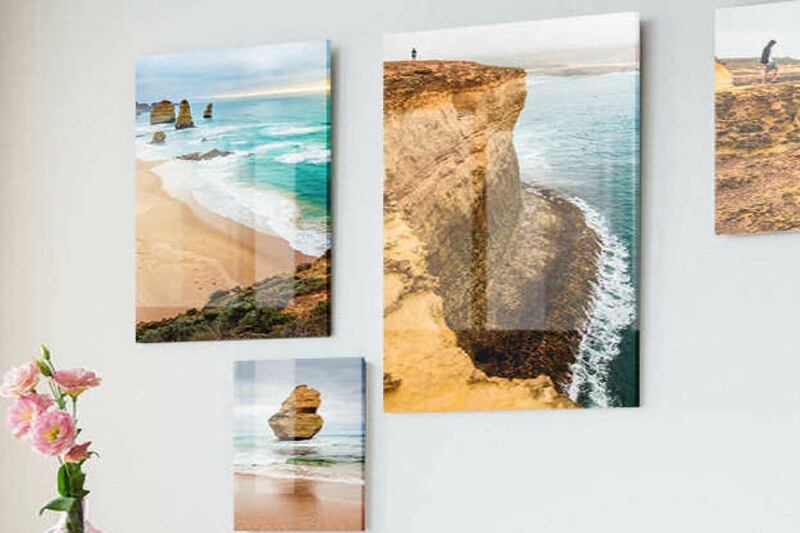 Apart from the production technique, regular canvas prints can be viewed as a somewhat more casual decor solution (suitable for practically any setting) while acrylic photo prints bear a certain mark of sophistication (making them perfect for office environments and contemporary galleries) and are, nonetheless, a more specific type of wall art decor. Capable of elevating your photo to new aesthetic heights, the acrylic glass will add color wherever it’s lacking.